Former MP for Phitsanulok Dr. Warong Dechgitvigrom confirmed the attendance of former Prime Minister Abhisit Vejjajiva on January 8, 2015. 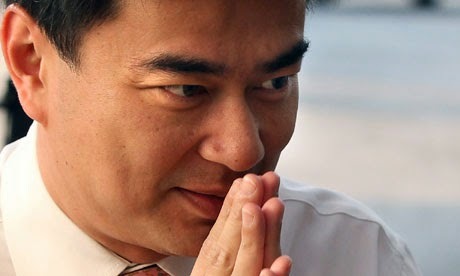 According to Dr. Warong, Mr. Abhisit is scheduled to visit Wat Sapansam School in the morning of 8th January to have a look on the development of the pilot project teaching English to poor kindergarten students which started in November last year. The former premiere is going to observe the classes of K1 students under my supervision, as well as K2 students under the tutelage of Ajarn Lloyd. The school will also have a pre-Children’s Day party on the said date, sponsored by the Democrat Party. It is our way to extend our help and make the students happy prior to Thailand’s National Children’s Day on the 10th of the same month, said Dr. Warong. Ajarn Lloyd and I planned some activities which will be shown to our visitors on the 8th as well as on Children’s Day itself at the provincial office. My plan of having a photo with the former premiere is about to happen. Can’t wait!